In 1949, the Hiroshima College of Literature and Science and the Hiroshima Higher Education Teaching College were merged, and Hiroshima University was born. 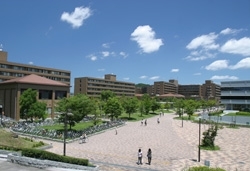 Hiroshima University has a reputation as a leading university among education universities in Western Japan, as well as being prominent among Japanese universities for its high number of students. With 12 undergraduate faculties and 11 graduate departments, Hiroshima University is the home to education and research which meet the needs of today’s world, including those of the Information Age, internationalization, and lifetime learning. Aside from the undergraduate and graduate faculties, Hiroshima University holds a variety of unique research centers including the Research Institute for Higher Education, Institute for Peace Science, Morito Institute of Global higher Education (hereafter, Morito Institute), and the Research Institute for Radiation Biology and Medicine. Furthermore, the education department offers a special Japanese Language education course for students studying to become Japanese Language teachers or Japanese Language specialists. In 1995, Hiroshima University was moved from Hiroshima City to Higashi-Hiroshima (apart from the Medicine and Dentistry Departments, which remain in Hiroshima City). Separated from the bustling city and surrounded by an abundance of nature, the vast Higashi-Hiroshima Campus provides the perfect study environment. Hiroshima City and Higashi-Hiroshima City are located in the Southern region of Hiroshima Prefecture. Both have direct access to the Seto Inland Sea, a mild climate, and are famous for their seaweed and oysters. The mountain area of northern Hiroshima Prefecture is famous for the traditional entertainment known as Kagura. One can also find many ruins of ‘Tatara (ironworks)’ in this area. Hiroshima City was the first city to fall victim to the atomic bomb, but now, as an official designated city dedicated to the quest for international peace, it is the home of many groups involved in peace-promoting activities, in which our program’s students have opportunities for participating. Higashi-Hiroshima City is located in a basin approximately 30 kilometers east of Hiroshima City. It has a long history as a town famous for its sake (Japanese rice wine). Recently, with the move of Hiroshima University and the establishment of several other private universities, as well as a great number of enterprise research centers, the city is rapidly developing into a center for academics and research. Furthermore, the recent prosperity of semiconductor, electricity and electronics production has led to a rapid increase in the population of Higashi-Hiroshima. A course intended mainly to improve Japanese language proficiency with supplementary study about Japan and Japanese culture. This course is comprised of three major components: a compulsory Special Japanese Language and Culture Study Program conducted solely for the students of this program; a research component consisting of topical research conducted under the guidance of a personal supervisor and the presentation of a research report; and participation in general Japanese and Japanese Affairs classes of the student’s choice. The Specialized Japanese Language and Culture Study Program involves the cooperation of professors both in and out of the Morito Institute, and offers students the chance to not only deepen their knowledge of Japanese language, culture，society, and the peace contemplated from Hiroshima through special lectures, but also allows them to experience Japanese history, culture and customs first-hand and the preciousness of peace through several study tours within Hiroshima Prefecture, the Chugoku region, and in the Seto Inland Sea and surrounding areas. The general Japanese Language and Culture classes are conducted for all foreign students of Hiroshima University, and students of this course may take any of the upper intermediate Level 4 and the advanced Level 5 classes, according to their personal ability and interests. For topical research, each of the students undertakes specialized research in a topic of their choice relating to Japanese language or culture. The students’ personal supervisors, including specialists in the study of the Japanese language, Japanese language education, and Japanese culture, oversee the research. If desired, students are also able to audit regular classes from other faculties along with other Japanese students. Every student is assigned with student supporters, who can offer advice or assistance on residential and college life. Students can also join in different international activities on campus. Morito Institute offers access to a computer room in the department, as well as the loan of a personal laptop computer. Wireless internet access is available in Morito Institute, the International House and certain other areas of the university. Morito Institute also holds a large collection of Japanese movies and animation DVDs available for loan, along with portable DVD players. It is hoped that students will make use of these to further their study by watching them in their free time. Every year, Morito Institute publishes the collection of the research reports written by the students. 1) Japanese Language Proficiency: Applicants must have an high level of Japanese ability. At the minimum, they must either hold or be able to pass Level N2 of the Japanese-Language Proficiency Test. 2) Educational Background/ Field of Study: Applicants must have studied Japanese for a minimum of two years and be majoring in Japanese Language and/or culture. First year students are ineligible for this program. Every program student completes specialized personal research and writes a research paper under the direction of his or her individual advising professor. This research process grows ability in focusing on subject, planning study, word processing in Japanese and public presentation. Course Completion Ceremony is held in September. In principle, classes usually run for 15 weeks during both semesters. Special Japanese Language and Culture Study program I & II: 4 hours per week during both semesters. It consists of special lectures on the Japanese language, culture and affairs, offered to only the program students by lecturers from the International Center and other Faculties, and study visits to cultural institutions and treasures. The research proposal presentation and mid-term presentation of each student’s personal research also takes place during this time. The following is the description of the contents of this course for 2018. The 2019 program may be subject to change. Theme of the final report is related to Japanese language, culture and society. If students are seeking opportunities to study with Japanese students, they may be able to do so through Faculty classes, e.g. in Letter, Education, etc., not offered by Morito Institute. Students arrive at the beginning of October, and return home in late September. An opening and closing ceremony, as well as the Research Presentation, where students give a brief presentation on the contents of their individual research report. All professors from the Morito Institute and some from the Education Department oversee the running of this program, and offer advice and support to students. There is no set of fixed course completion requirements, but instead students, in consultation with their personal supervisor, must decide the number and types of classes to be taken. They must also submit a report based on their personal research. A certificate of completion, signed by the president of the university, will be awarded at the closing ceremony. ※In order to cover living expenses and set-up costs until the time of the first scholarship payment, it is suggested that students bring a minimum of \100,000 with them to Japan. Printed Research Reports Books are delivered to completed students and their home university. Research Reports' files are registered for general use at Morito Institute HP repository. Past program activity records are accessible to completed students. All completed students are booked on our program’s mailing list and informed about present program activities.